Welcome back to Messier Monday! In our ongoing tribute to the great Tammy Plotner, we take a look at the Andromeda Galaxy, also known as Messier 31. Enjoy! One of these objects is the famed Andromeda Galaxy, the closest spiral galaxy to the Milky Way which is named for the area of the sky it appears in (in the vicinity of the Andromeda constellation). It is the largest galaxy in the Local Group, and has the distinction of being one of the few objects that is actually getting closer to the Milky Way (and is expected to merge with us in a few billion years!). Approaching us at roughly 300 kilometers per second, our massive galactic neighbor has been the object of studies of spiral structure, globular and open clusters, interstellar matter, planetary nebulae, supernova remnants, galactic nucleus, companion galaxies, and more for as long as we’ve been peering its way with a telescope. It’s part of our Local Group of galaxies and its two easily visible companions are only part of the eleven others that swarm around it. One day, this galaxy will collide with our own, much as it is now consuming its neighbor – M32. However, this won’t come to pass for several billions years, so don’t go worrying about the immense gravitational disturbances just yet! And not surprisingly, a giant galaxy like Andromeda doesn’t get to be so big by keeping to itself. How many times now has the Great Andromeda Galaxy consumed another? More than once! Perhaps one of the most fascinating discovery recent years in Messier 31 was made by the orbiting Chandra X-Ray Observatory. The X-ray image below, made with the Chandra X-Ray Astronomy Center’s Advanced CCD Imaging Spectrometer (ACIS), shows the central portion of the Andromeda Galaxy. The Chandra X-ray Observatory is part of NASA’s fleet of “Great Observatories” along with the Hubble Space Telescope. In 2005, we discovered more. At that time, Scott Chapman of Caltech, Rodrigo Ibata of the Observatoire de Strasbourg, and their colleagues conducted detailed studies on the motions and metals of nearly 10,000 stars in Andromeda, which that the galaxy’s stellar halo is “metal-poor.” Essentially, this indicated that the stars lying in the outer bounds of the galaxy are lacking in elements heavier than hydrogen. While no one yet knows what dark matter is made of, its existence is well established because of the mass that must exist in galaxies for their stars to orbit the galactic centers. In fact, current theories of galactic evolution assume that dark-matter wells acted as a sort of “seed” for today’s galaxies, with the dark matter pulling in smaller groups of stars as they passed nearby. What’s more, galaxies like Andromeda and the Milky Way have each probably gobbled up about 200 smaller galaxies and protogalactic fragments over the last 12 billion years. Chapman and his colleagues arrived at the conclusion about the metal-poor Andromeda halo by obtaining careful measurements of the speed at which individual stars are coming directly toward or moving directly away from Earth. This measure is called the radial velocity, and can be determined very accurately with the spectrographs of major instruments such as the 10-meter Keck-II telescope, which was used in the study. Of the approximately 10,000 Andromeda stars for which the researchers have obtained radial velocities, about 1,000 turned out to be stars in the giant stellar halo that extends outward by more than 500,000 light-years. These stars, because of their lack of metals, are thought to have formed quite early, at a time when the massive dark-matter halo had captured its first protogalactic fragments. The stars that dominate closer to the center of the galaxy, by contrast, are those that formed and merged later, and contain heavier elements due to stellar evolution processes.In addition to being metal-poor, the stars of the halo follow random orbits and are not in rotation. Andromeda was known as the “Little Cloud” to Persian astronomer Abd-al-Rahman Al-Sufi, who described and depicted it in 964 AD in his Book of Fixed Stars. This wonderful galaxy was also cataloged by Giovanni Batista Hodierna in 1654, Edmund Halley in 1716, by Bullialdus 1664, and again by Charles Messier in 1764. A great many astronomers would observe the Andromeda Galaxy over the years, each colorfully describing it. However, as we know from history, it would be quite some time before its true nature as an external galaxy would be discovered. Here is where we must give the utmost respect to Sir William Herschel, who knew way ahead of everyone else, that there was something very, very different about Messier’s Object 31! Even under moderately light polluted skies the Great Andromeda Galaxy, located in the Andromeda constellation, can be easily be found with the unaided eye – if you know where to look. Seasoned amateur astronomers can literally point to the sky and show you the location of M31, but perhaps you have never tried to find it. Believe it or not, this is an easy galaxy to spot even under the moonlight. Simply identify the large diamond-shaped pattern of stars that is the Great Square of Pegasus. The northernmost star is Alpha, and it is here we will begin our hop. Stay with the northern chain of stars and look four finger widths away from Alpha for an easily seen star. The next along the chain is about three more finger widths away. Two more finger widths to the north and you will see a dimmer star that looks like it has something smudgy nearby. 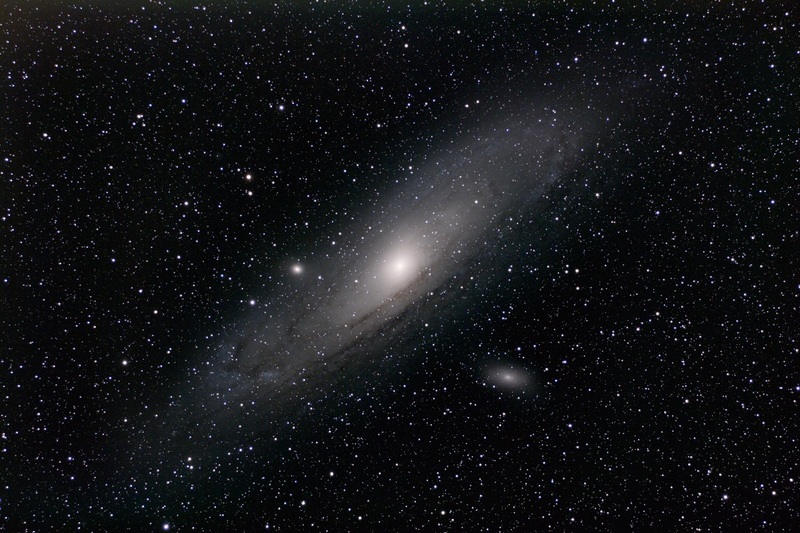 Point your binoculars there, because that’s no cloud – it’s the Andromeda Galaxy! Now aim your binoculars or small telescope its way… Perhaps one of the most outstanding of all galaxies to the novice observer, M31 spans so much sky that it takes up several fields of view in a larger telescope, and even contains its own clusters and nebulae with New General Catalog designations. If you have a slightly larger telescope, you may also be able to pick up M31’s two companions – M32 and M110. Even with no scope or binoculars, it’s pretty amazing that we can see something – anything! – that is over two million light-years away! Enjoy this wonderful and mysterious galaxy at any and every opportunity! Even the most modest of optical aids will reveal it for what it is… Another island universe! And here are ye’ ole’ quick facts. Enjoy!